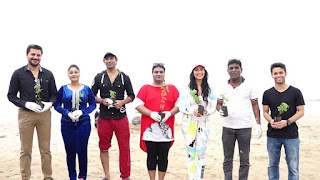 Niharica Raizada says its important we think about the nature as much as we think about our family. 'Total Dhamaal' actress Niharica was spotted at Aksa Beach for a beach cleaning campaign on Monday after Ganpati Visarjan. When talking about beach cleaning and her experience Raizada emphasised there is still long way to go if we want our beaches blue and clean. 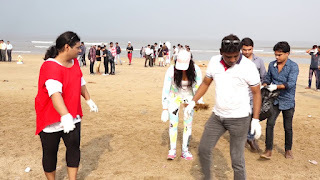 "This was my first experience coming here to clean the beach, I have been to Aksa Beach for shoots many times and I have always thought we have such beautiful beaches why don't people keep it clean. If you had started years ago even we would have had clear blue beaches. The only message I hope people will understand is to think about the nature as much as you think about your family. She also said coming to the beach and contributing made her feel like, "I am fulfilling my duty has a good citizen to this country and I will continue to do so. Whether more people join in and support or don't I will continue to walk this path. I do hope to see the scope of improvement in people, we still have a long way to go."